At Dream Smile Center, you can have beautiful white teeth in less than an hour while you relax in a BrookstoneTM uHarmony heated message chair, which can hook up to any CD or MP3 player. Call today to schedule your appointment. Do you want to Zoom!? 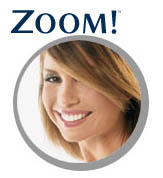 Dream Smile Center offers Zoom In-Office Whitening System to patients seeking immediate teeth whitening results. Patients can get an average of 8 shades whiter in just 45 minutes with Zoom! 's innovative teeth bleaching system. Zoom! has been clinically proven to be safe and effective and many dentists consider whitening the safest cosmetic dental procedure available. Whitening is ideal for anyone looking for immediate results. The convenience of Zoom! in comparison to days of wearing trays and gradual whitening makes it the perfect choice for the busy individual. This is the classiest dentist office I have ever been to. It smells wonderful. The dentist, is SO nice! They have state of the art technology, and the staff is incredibly professional and always happy. Never in my life have I been to a better dentistry. I highly recommend this place!!!! Dr Bartlett & staff were excellent & professional! Very knowledgeable. Took time to listen & explain everything! Highly recommend!